A friend sent me an article from Today.com which reports that three is the most stressful number of kids. It’s not hard to understand the challenges of three. We only have two hands – one for each child if there are only two. As kids grow, there is always the problem of two against one. That happens even in social situations. Then there is that middle child who has to make her way without having the distinction of being the oldest, or the benefits that go with being the youngest. Actually. the article turns out to be more about mother stress generally, than about the particular stress caused by having three children. A recurring theme in the survey reported on is the stress caused by trying to be perfect. Seventy five percent of mothers said they are stressed more by the pressure they put on themselves to be perfect than the pressure of the judgments made of them by others. This finding does not come as a surprise. That famous “mothers’ guilt” is a result in part from mothers faulting themselves for this or that they have done – or not done – to or for their children. Many mothers say that the most stressful part of mothering is not knowing if you are doing a good job, worrying about whether or not you are doing the “right thing.” And, of course, there is a long history of mothers being held responsible for everything a child does – as if they alone determine a child’s personality and behavior. Above all, mothers want the best for their children, and ideas about what the best is keep changing. Mothers’ Day just over, we have all been treated to the outpouring of flowers and greeting card poetry extolling the virtues of mother. This is the day reserved for the idealization of motherhood, while the rest of the year is open season for criticism of actual mothers. So the demand for mothers’ perfection is all around us, and there is little wonder that it has been internalized by mothers, themselves. But there may be a deeper reason within mothers that leads us to hold on to, and strive for, the perfection ideal. It may also be the very thing that leads us down the garden path to some of the difficulties mothers have at times with their children. To put it very simply, children start out as infants seeing us as perfect and we don’t want to disillusion them. Our little children look up at us adoringly, and who wants to give that up? Certainly, no one else in our lives looks at us as perfect. Even our mothers didn’t, and certainly not our mates, even though loving us. In the early months of life our children are totally dependent creatures, and we try to meet all their needs to be fed, held and attend to them when they cry. Little by little, however, they have to be brought into the world they will have to live in, which means experiencing some frustration. They may not be fed or picked up the minute they want to be. As they grow, their wishes and needs become more complex, and it becomes more difficult for mom always to know exactly what a particular cry might mean. There also will be times when the baby wants something that isn’t good for him, or that mom doesn’t want him to have. Little by little the baby begins to give up the illusion that mother is perfect. And it is a good thing that he does, because that is what helps along that maturational push to do things for himself so that he can ultimately be independent. This process is not always accepted by young children with equanimity. So frustration may bring about moments of unhappiness, protests, or tantrums. At those moments, gone is that look of love that is so rewarding to mothers and makes it all worthwhile. The truth is that mothers, as well as their children, resist that process of disillusionment which brings with it the realization that mother is not perfect. Without being aware of it, we try to join our children in maintaining the illusion of perfection. What that can turn into, is an attempt to avoid frustrating our children, and the attempt to keep them happy all the time. Of course, no one thinks children should be frustrated just for the sake of experiencing frustration. But we don’t have to worry about that, because life itself takes care of it. 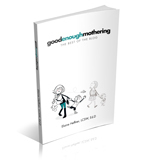 Mothers often feel that a child’s protests, or upsets, mean that she is doing a bad thing. The only “bad” thing she is doing is helping a child live through the reality that he can’t always have what he wants, or that at times everyone feels sad, or bad, or angry, or frustrated. So the irony is, the very thing mom is working so hard not to give up – being a perfect mother – is the very thing she has to give up for her child to grow up. Giving up the illusion of perfection is also liberating for our children – it relieves them of the need to be perfect.